General government EDP debt, or consolidated gross debt at nominal prices amounted to EUR 135.8 billion at the end of the second quarter of 2018 and grew by EUR 0.4 billion during the second quarter. Correspondingly, general government debt has fallen by EUR 0.4 billion compared with the respective period of the year before. These data derive from Statistics Finland's statistics on general government debt by quarter. During the second quarter, central government debt grew by EUR 0.3 billion and was EUR 115.4 billion at the end of the quarter. The amount of short-term debt instruments with a maturity of under one year decreased during the second quarter by EUR 0.4 billion due to amortisations. The stock of bonds grew by EUR 0.7 billion over the same period. The stock of short-term and long-term loans remained nearly on level with the previous quarter. The local government sector's debt decreased by EUR 0.1 billion and totalled EUR 19.7 billion at the end of the quarter. The stock of money market instruments grew by EUR 0.6 billion, but bonds and long-term loans decreased by EUR 0.7 billion. The debt of social security funds totalled EUR two billion at the end of the quarter. The amount of short-term loans of social security funds decreased by EUR 0.5 billion due to the decline in cash collateral received in connection with employment pension schemes' derivative contracts and securities lending. General government EDP debt describes general government’s debt to other sectors of the national economy and to the rest of the world, and its development is influenced by changes in unconsolidated debt and internal general government debts. Consolidated general government gross debt is derived by deducting debts between units recorded under general government from unconsolidated gross debt. For this reason, general government debt is smaller than the combined debts of its sub-sectors. The EDP debt of general government differs conceptionally to some extent in the case of central government from the central government debt published by the State Treasury. Central government's EDP debt also includes loans granted to beneficiary counties by the European Financial Stability Facility EFSF, received cash collaterals related to derivative contracts, the capital of the Nuclear Waste Management Fund, debts generated from investments in central government's PPP (public-private partnership) projects, coins that are in circulation, and the deposits of the European Commission. 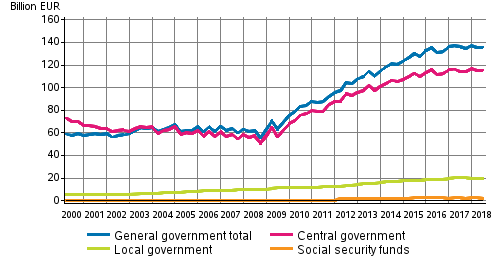 In National Accounts, central government is also a broader concept than the budget and financial economy (http://www.stat.fi/meta/luokitukset/_linkki/julkisyhteisot.html). The valuation principle for both debt concepts is the nominal value, where the effect of currency swaps is taken into account. ISSN=1799-8034. 2nd quarter 2018. Helsinki: Statistics Finland [referred: 21.4.2019].